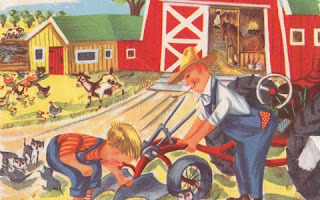 Vintage Kids' Books My Kid Loves: Who Am I? I dig the coal to heat your town. I load the coal in little cars. I work in the darkness. So the book goes on like this, alluding to some mystery occupation which is easily guessed through the rhyme and pictures provided. I love the fact that the jobs listed in the book are... train conductor, coal miner, farmer, pilot, cowboy and fireman. WOW. My son's been listening to a Sesame Street classics album of late and has become obsessed with the song "Who Are the People in Your Neighborhood" so this one helped to bring it home. Though unfortunately, along with the milk man, I'm gonna have a hell of a time pointing some of these guys out in our walks about town. I just found a copy of this book yesterday at a thrift store. It is very cute and the pictures are really bright and cheerful. Nice to see that another generation will be influenced by some wholesome thoughts. Thanks for writing.